When it comes to going to church, Ukraine is mostly Orthodox Christian, but Protestant churches are gaining a foot-hold there. One of the biggest now is the evangelical Embassy of God, based in the capital Kiev. 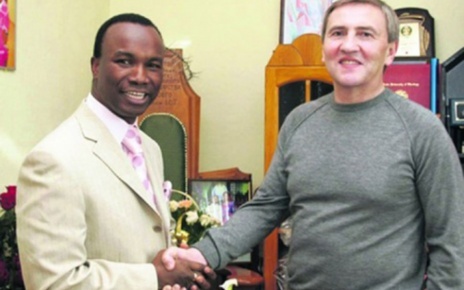 The church’s founder, Sunday Adelaja, originally hails from Nigeria and he represents an unusual success for Africans in the former Soviet world. Adelaja, who grew up in a poor Nigerian village, said couldn’t afford to go to college. Then in 1986, he got a rare offer. Adelaja laughs at this because he kept a secret from the Soviet Communists. Before moving to the officially atheist Soviet Union, he became an evangelical Christian. He kept his faith under wraps until the USSR fell apart in 1991. “I just knew that God was pressing me, pressing upon my heart, to step up from the boat, and step into the water, and try to just offer the word of life, the gospel, to the nation of Ukraine,” Adelaja said. It wasn’t easy at first. Adelaja said that’s because he’s black. Africans still face frequent harassment in Ukraine and other parts of the former Soviet Union, and you can still find racist depictions of blacks in the media. Still, Adelaja managed to get his own Sunday morning television show in the mid 1990s. And his church, Embassy of God, began to grow. It now claims to have 100,000 members, though that number is hard to verify. Adelaja preaches the so-called “prosperity gospel,” that God intends the faithful to have financial wealth and happiness. It’s in contrast to the Orthodox Church emphasis on reward in the afterlife. Adelaja no longer has a TV show, but his church is sprouting branches around Ukraine and beyond. In suburban Kiev, about 100 Embassy of God members meet in a wood-paneled, Soviet-era auditorium. It’s extremely cold out, and the worshippers keep their coats and hats on as they sway to the music in the sanctuary. Their pastor, Ruslan Mahmedov, pulls up the day’s Bible verses, in Russian, on his iPad and projects them on a screen behind him. Many here say Embassy of God helped them when no one else would. Yuri Shostak says that four years ago, when he got out of prison, he was living in the storm sewers. Then he got into a drug rehab program run by the church, and now works there helping other addicts. But not everyone is glad Sunday Adelaja is in Ukraine. Authorities in the Orthodox Church have condemned him. They say Embassy of God is nothing more than a cult with a charismatic leader. According to Ivan Bodnaruk, a Kiev attorney, it’s worse — the church is a financial scam. Bodnaruk represents hundreds of Ukrainians in a civil case against Adelaja and members of Embassy of God. It all goes back to an investment fund that church members started here in 2006. The Kings Capital fund promised high dividends. But it turned out to be a Ponzi scheme that bankrupted many investors — people like Elena Urbanskaya. She mortgaged her apartment to invest in King’s Capital. She said Embassy of God members coached her through the whole process. Then the fund collapsed and she lost everything. “It was a terrible shock for people, because within the church, people trusted each other,” Urbanskaya said. Ukrainian prosecutors maintain that Adelaja ran Kings Capital from behind the scenes. They’re pursuing charges that could put him in prison for up to 12 years. Adelaja denies any involvement. “Just prove what I have done! I don’t even know what I have done. I’ve never visited the company. I don’t even know where it is,” he said. Adelaja added that his goal was never to make money and amass power, but to save souls. Now, he said, he can’t walk the streets without someone shouting insults at him, or worse. “Believe you me. For every day I stay in the Ukraine, I die a thousand deaths,” Adelaja said. Perhaps it was the below-zero temperatures, but on a recent Sunday morning, the main chapel of Embassy of God was only a third full. It’s an inflatable structure, like those that house tennis courts. It’s supposed to be temporary. Embassy of God hopes to build a new mega-church. But that’s on hold for now. Membership and donations are way down. Adelaja blames that on bad publicity from the legal case. The case could take years to resolve.